When most people hear “family law attorney”, they think “Divorce Attorney”, which is a common assumption. The majority of my work as a family law attorney deals with dissolving and dividing the marriage and its property. The end of a marriage is often complicated and contentious. A situation that is already emotionally charged becomes fully combustible by adding money and assets -or in worst case scenarios – fighting over debt. Preparing for that outcome should be part of your long-term marriage planning. 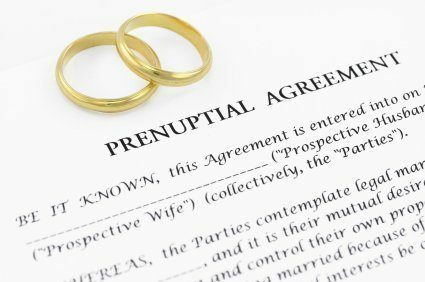 A premarital or prenuptial agreement cannot ensure a happy healthy marriage, but it can provide some clarity in the event of divorce, separation, or death. Data shows that millennials are older than baby boomers were when getting married for the first time. Baby boomers and Gen X are now on second and third marriages. As these groups age, they bring more to the marriage. As the average age of marriage rises, it comes with added assets such as increased saving accounts, home ownership, retirement accounts, and children. It also comes with college debt, ex-spouses, alimony, and child support. Before walking down the aisle, get informed on your marital responsibility. You want to protect your property in the event of divorce. A prenuptial or premarital agreement allows you to identify and exclude separate property from the marital estate and retain its separate nature. Under North Carolina law, the act of marriage does not transform separate property to joint property but if the “source of funds” cannot be traced to separate property that property may be assumed marital. Classifying and detailing what is to remain separate regardless of marital efforts can protect that property in divorce and shield it from equitable distribution. Marital Property is defined by North Carolina Equitable Distribution Statute N.C.G.S. §50-20 as: “all real and personal property acquired by either spouse or both spouses during the course of the marriage and before the date of the separation of the parties, and presently owned, except property determined to be separate property or divisible property…”Marital property is subject to equitable distribution by the court. A Judge will weigh a number of factors to identify, classify, and distribute the marital property between the spouses. A premarital agreement can avoid a lengthy and costly court battle by determining how marital property will be divided before the marriage begins. North Carolina Law allows a spouse to take an elective share of a deceased spouse’s estate. The amount a spouse may “elect” to receive varies based on the length of the marriage. The elective share grants the surviving spouse inheritance rights regardless of whether he or she has been left out of the deceased’s will. Client’s entering into a second or third marriage likely have children and grandchildren that they want to leave money and property to through a will. Without a premarital agreement including an estate waiver they lose control over how their property may be disposed of upon their death. A Dozier Miller attorney can draft a premarital agreement that waives the right to an elective share and allows a client’s will to control. The primary advantage of a premarital agreement is predictability. Allowing spouses to plan and prepare for what will happen in the event of a separation or divorce. A premarital agreement can specifically waive a spouse’s rights to alimony or spousal support. The prenuptial agreement can also detail how alimony or spousal support will be paid, limit the amount, and define the duration of payments. All premarital agreements in North Carolina require voluntariness. To be voluntary the parties must know what rights they are waiving before entering into that agreement. One key portion included in any premarital agreement is the financial disclosure of the parties. Without a financial disclosure a prenuptial agreement may be set-aside or voided by a court. The parties must list and identify what assets, liabilities, and income they are each bringing to the marriage before a valid premarital agreement can be finalized (unless the parties knowingly waive the right to a disclosure, but this is not advisable). In addition to the disclosure, you want to plan ahead before entering into your premarital agreement. Signing the premarital on the steps of the chapel is not only unromantic it may affect the enforceability of the prenuptial agreement. Dozier Miller attorneys have previously had agreements set aside that were entered by fraud or signed to close to the wedding date. Juries have nullified agreements made on the morning of the wedding. So, when preparing for your wedding day, between selecting the caterer and the photographer, contact an attorney at Dozier Miller to discuss and protect your rights with a premarital agreement. People never go into a marriage hoping it will fail but a premarital agreement can protect you in the event that hope is not realized.